A slice of lemon on your pizza? After years of trying out all sorts of techniques, I have converged on a few basic aspects in pizza making – a) a soft and stretchy dough that is not a rubber mat but has sufficient elasticity to be hand stretched into a thin base, b) a 500-600F oven, and c) minimal but flavorful topping. Result is a chewy crust with a crisp bottom and rich flavors in every bite. Some say that we should always eat whole grains. I agree, whole heartedly. I have gladly swapped out white bread for wheat bread – thanks to Acme. There is no better chappati than whole wheat one. I adore whole wheat or buckwheat parathas and puris. I have cheerfully replaced white flour with whole wheat pastry flour in cookies and cakes. I have even grudgingly swapped out regular pasta and white rice for whole wheat pasta and brown rice. But no whole wheat pizza for me. I have tried to swap out regular flour with white whole wheat, part whole wheat, part whole wheat pastry flour and I have failed to like them. So, my compromise – I don’t make pizza often and when I do, I don’t eat too much of it. 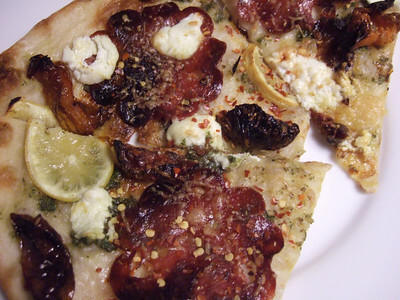 If, however, you have to have whole wheat pizza, then give Heidi’s recipe a try. 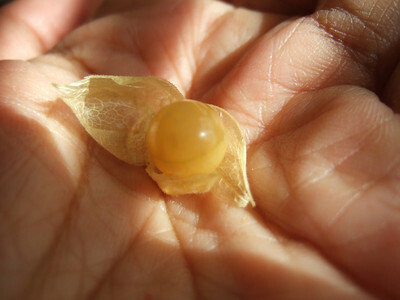 Cape gooseberry (Rasbhari in Northern India) is giant version of the ground cherry. Rasbhari is about the size of a kumquat and ground cherry is 1/4 that size. So giant is perhaps not the right description but you get my meaning. If you are living in India, you don’t think of rasbhari as uncommon. Seasonal yes, but uncommon no. In fact, during the season if you are stuck in slow moving traffic you will likely bring home a bunch from one of the numerous street vendors. But if like me, you travel to India, it is a treat like jamun. So, when my husband said in spring this year that he has found a source for ground cherry, I was naturally excited even if it meant growing from a seedling. Ours came from Seed Saver Exchange. The rest was simple. Transplant, watch em’ grow slowly, very slowly. These bushes start to fruit even when they are a meager 4 inches tall. Wait for the fruits to ripen and fall off the plant. Eat. The yogurt curry is like hot raita. It is tasty and when had with a bowl of white rice, is a light and easy to digest meal. The lovely yellow color comes from turmeric, a spice with anti-fungal and anti-inflammatory responses. An ingredient is this spice, called curcumin, is now being tested against Alzheimer in scientific studies. The nutrition in the meal comes from the steamed spinach dumplings. A pack of frozen chopped spinach, microwaved for a few minutes until warm. 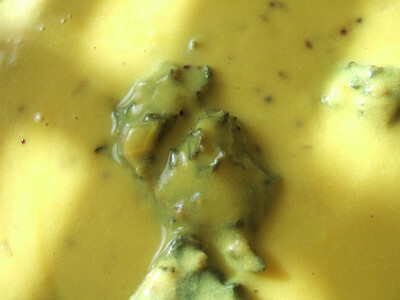 3/4 cup of besan (de-husked black gram flour). 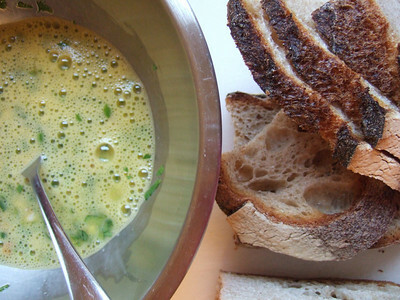 Can be substituted with chickpea flour. Mix the above ingredients to make a soft dough. Prepare your steamer – I use a bamboo steamer. Make small dough balls with your fist, shape is not terribly important, and steam for 12 minutes. Cool and chop into bite size pieces. Cook’s reward: Pop a few of these pieces in your mouth while you proceed with the rest. Pinot noir from Beaune, Burgundy. Plummy. Not peppery. Earthy / forest floor / mushroomy nose. From KLWines: This single vineyard Savigny comes from Connardises, a vineyard located right at the fork in the road as you come from Beaune and turn toward Pernand Vergelesses. It is a relatively flat site, directly below Lavieres 1er Cru, with deeper soils. The vines are over 80 years old in this plot, and the result is wine with fine structure and lots of concentration. Old vines such as this also respond brilliantly to the more natural viticulture instituted by Pascal Marchand. The result is a wine with no rusticity. Instead, the very old Pinot Fin vines yield fruit that makes a wine of finesse, structure and elegance, with notes of red plums as well a some blacker fruits. A pinot noir from Meursault is an appellation in Côte d’Or. Screwtop bottle. Clean tasting pinot noir – light on the palate, rich berry, very peppery. From KLWines: This cuvée comes 75% from Marsannay, 10 % from Gevrey Chambertin, and 15% from Bourgogne Rouge vineyards below Vosne Romanée and Chambolle Musigny. I grew up eating desi style french toast. 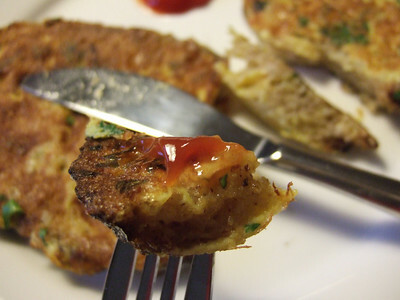 If we can improvise to create McAloo Tikki Burger, desi style french toast shouldn’t come as surprise. It is a savory version of the french toast with a touch of desi flavors. 6-7 pieces of sliced baguette (3-4 cm across, 1/2 cm thick). Alternately use country style wheat bread. Shallots can be replaced with onion. If onion is sharp, soak chopped onion in cold water for a couple of minutes before adding to eggs. Thai green chili can be replaced by de-seeded jalapeno if necessary. Addition of sugar makes this dish slightly sweet and mostly savory. Beat the eggs, mix in milk, shallot, chilli pepper, coriander, salt and pepper. Soak 2-3 slices for about 2 minutes. Fry in 2 tsp of neutral oil such as canola and serve with ketchup or chutney. All the goodness of french toast stays the same – creamy centers if using white bread or the chewiness if using country style wheat bread. The savory aspect of this is healthier. The ketchup adds to the umaminess. Every once in a while you will bite into a sliver of hot green chilli that will light a part of your mouth on fire – very invigorating in the morning. For a perfect breakfast, enjoy with a cup of hot chai.